Enter a world full of evil textures, twisted drones, and noise soundscapes designed to scare the hell out of any mortal. 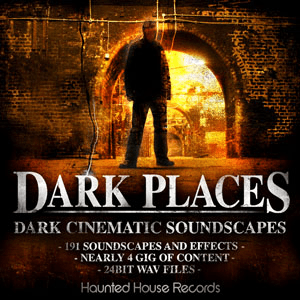 Dark Places features 191 twisted drones, and soundscapes ideal for music productions from dark ambient, dark electronic music through to Rock and Metal. Dark Places is also ideal for use in your film and TV productions for adding that cinematic edge to your horror music, thriller music or any other scene that requires tension build ups. Dark Places has been created by veteran sound designer Stephen Haunts. Stephen is no stranger to the darker side of music and has produced dark ambient albums that have received excellent reviews and acclaim. Stephen hasn’t just stopped at music releases. He has produced dark cinematic soundscapes to the film industry as well as the BBC. If you want your music to have that sinister edge or your horror / thriller films to scare the living daylights out of your audience then look no further than Dark Places. – 147 Soundscapes and Drones. – 24 Weather and Atmospheric sounds effects. – 20 Impact sound effects.